AERIAL PHOTOGRAPHY NOW WITH SCRIPTURE NARRATIVES! Retailers: New Title - See Retailer's Corner! ~~Soar across the skies of beautiful Israel and visit contemporary and historic sites beckoning visitors to stay and explore. The beauty of Israel from above is captured by top, aerial photographer, Ron Gafni. As you sweep over ancient ruins, fly high in hot air balloons and view vignette's of Israel's modern lifestyles, Holy scripture will also come alive. Author, Kathleen Barrett offers reflective narrative with scripture pointing to God's redemption plan for the world. 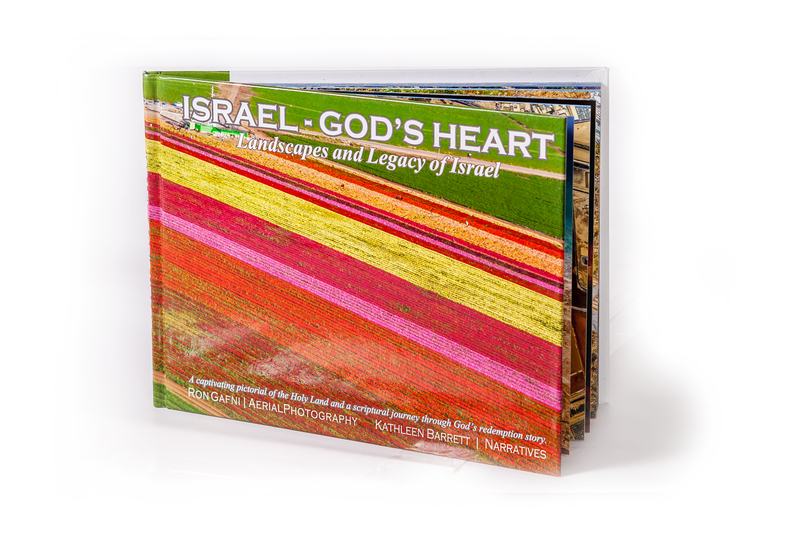 Landscapes and Legacy of Israel. A presentable and dignified gift that will leave a lasting impression. Fits nicely in your suitcase and light to carry. Inexpensive to ship. The most important feature - it’s a gift that "speaks" the customer's language and shows him how important he is to you. not just through gorgeous photography, but also through fantastic paragraphs on each page. The book is simply exquisite! what you would see it is sure beautiful. The photos were absolutely gorgeous. I absolutely loved seeing them. which includes pictures, Bible verses, descriptions of what you see as well as significant historical events which are tied in to them. Ron Gafni is a professional aerial photographer that has taken many beautiful pictures of the landscapes in Israel. UNIQUE AND RICH IN VALUE! The book can come in a personal gift wrap or boxed in tissue paper. Another unique and appreciated gift is to combine the album with exquisite gift boxes containing Israeli made products such as dates, olive oil, chocolate, honey, wine and liqueur or with hand crafted tiles depicting Israeli motifs. A GIFT FOR EVERY SEASON AND EVERY OCCASION! We will be delighted to be at your service, consult, advise and assist you with matching just right products for your customers, and to match your requirements and budget. EYE CATCHING ON YOUR SHELF! 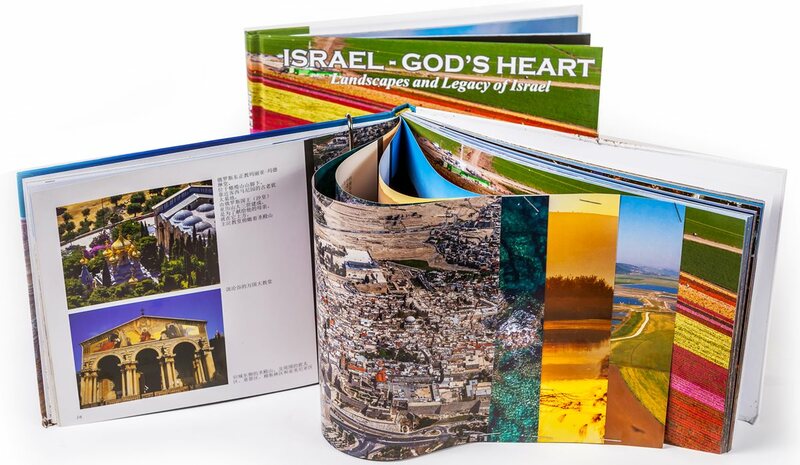 At first glance, Israel – God’s Heart, a collaboration between photographer Ron Gafni and author Kathleen Barrett, looks like another nice collection of travel photographs. But as you turn the pages, you find yourself slowing down, flipping back and forth as patterns emerge, getting drawn deeper into the Holy Land. Ron Gafni’s wonderful photography ranges from intimate glimpses to broad landscape to spectacular aerial views. Kathleen Barrett’s spare narrative is perfectly in tune with the imagery – tying biblical passages to actual sites, exploring the relationship between place and vision. This is a book that you will find yourself returning to again and again for the simple beauty and for inspiration. Kathleen Barrett will be at Poetic Justice Books & Arts this Friday, September 28 2018, at 6:00PM.